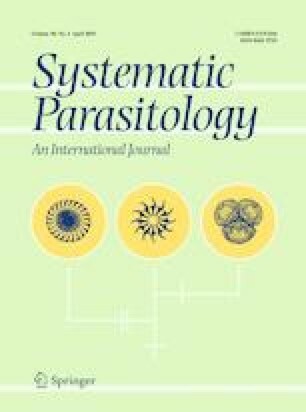 We examined faeces of 76 endangered Tibetan antelopes Pantholops hodgsonii (Abel) in May 2017, from the Hoh Xil Nature Reserve, Qinghai Province, China, and found 62/76 (82%) discharging oöcysts representing five new species of Eimeria Schneider, 1875. Oöcysts of Eimeria pantholopensis n. sp., found in 54/76 (71%) chiru, are subspheroidal/ellipsoidal, 15–22 × 12–19 (18.6 × 16.1) µm, with a length/width (L/W) ratio of 1.0–1.3 (1.2); micropyle cap and 1–3 polar granules are present, but oöcyst residuum is absent. Sporocysts are ovoidal, 7–11 × 4–6 (9.2 × 5.3) µm, with a L/W ratio of 1.6–2.0 (1.7); Stieda body and sporocyst residuum of small, scattered granules are present; each sporozoite contains 2 refractile bodies. Oöcysts of Eimeria wudaoliangensis n. sp. found in 52/76 (68%) chiru, are pyriform, 21–29 × 17–21 (24.9 × 19.0) µm, with a L/W ratio of 1.1–1.5 (1.3); micropyle, micropyle cap and 1–4 polar granules are present, but oöcyst residuum is absent. Sporocysts are ovoidal, 9–13 × 5–8 (11.7 × 6.7) µm, with a L/W ratio of 1.4–2.7 (1.7); Stieda body and sporocyst residuum of disbursed granules are present; sporozoites have a single large refractile body. Oöcysts of Eimeria hodgsonii n. sp. found in 20/76 (26%) chiru, are elongate-ellipsoidal, 25–32 × 18–21 (28.9 × 19.8) µm, with a L/W ratio of 1.2–1.7 (1.5); micropyle, micropyle cap and 1–3 polar granules are present, but oöcyst residuum is absent. Sporocysts are ovoidal, 11–14 × 6–7 (12.3 × 6.8) µm, with a L/W ratio of 1.7–2.1 (1.8); Stieda body and sporocyst residuum as group of large granules lying along the interface between intertwined sporozoites are present; sporozoites have 2 refractile bodies. Oöcysts of Eimeria schalleri n. sp. found in 49/76 (64.5%) chiru, are ellipsoidal, 26–36 × 19–25 (30.4 × 23.2) µm, with a L/W ratio of 1.2–1.5 (1.3); micropyle with micropyle cap and polar granules appearing as many diffuse tiny bodies are present, but oöcyst residuum is absent. Sporocysts are ovoidal, 12–16 × 7–9 (14.2 × 7.8) µm, with a L/W ratio of 1.6–2.1 (1.8); Stieda body and sporocyst residuum are present, the latter as a group of small dispersed granules between intertwined sporozoites; sporozoites with 2 refractile bodies. Oöcysts of Eimeria sui n. sp. found in 4/76 (5%) chiru, are ovoidal, 32–38 × 26–30 (36.6 × 28.6) µm, with a L/W ratio of 1.0–1.4 (1.3); micropyle and micropyle cap and 1–3 polar granules are present, but oöcyst residuum is absent. Sporocysts are ovoidal, 15–18 × 8–10 (16.7 × 8.9) µm, with a L/W ratio of 1.7–2.1 (1.9); Stieda body and sporocyst residuum are present, the latter as a group of dispersed small granules; sporozoites with 2 refractile bodies. Five of 62 faecal samples in which oöcysts were detected (8%) had a single species infection, 13 of 62 (21%) had two species, 28 of 62 (45%) had three species and 16 of 62 (26%) had four species. This article was registered in the Official Register of Zoological Nomenclature (ZooBank) as A7C9C307-1709-4A33-B8FA-8A8318231C19. This article was published as an Online First article on the online publication date shown on this page. The article should be cited by using the doi number. This is the Version of Record. We thank the Bureau of Hoh Xil National Nature Reserve for their assistance in the field and Mr. Wen-zhu Song for the line drawings of our sporulated oöcysts. This work was supported by the Basic Research Program of (2017-ZJ-723) Qinghai Province. All applicable institutional, national and international guidelines for the care and use of animals were followed.